Yes, it’s as good as you’ve heard—and much better than it looks. 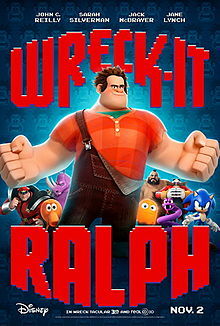 When my family and I first saw previews to Wreck It Ralph, my husband was excited—but my daughter and I sort of just shrugged. It didn’t look that great, Disney or not, and like Wall-E, the previews just didn’t hook me. Maybe it was targeted at boys—though the girlie previews don’t hook me any better—but it also wasn’t clear about what the plot really was, which always annoys me. Add that to putting the best moments in the trailer and you’ve got a flop on your hands.